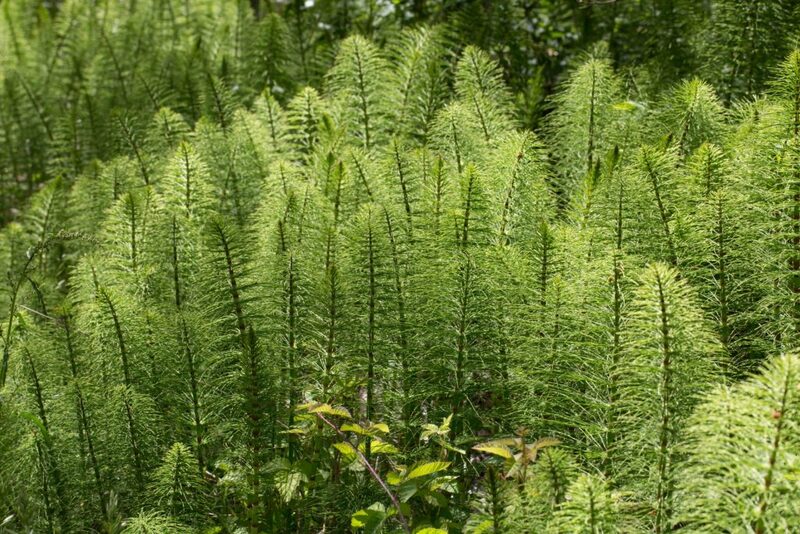 Although they do not bear much resemblance to other ferns, horsetails and scouring rushes are in fact true ferns, the result of the way in which they reproduce rather than anything to do with their appearance. 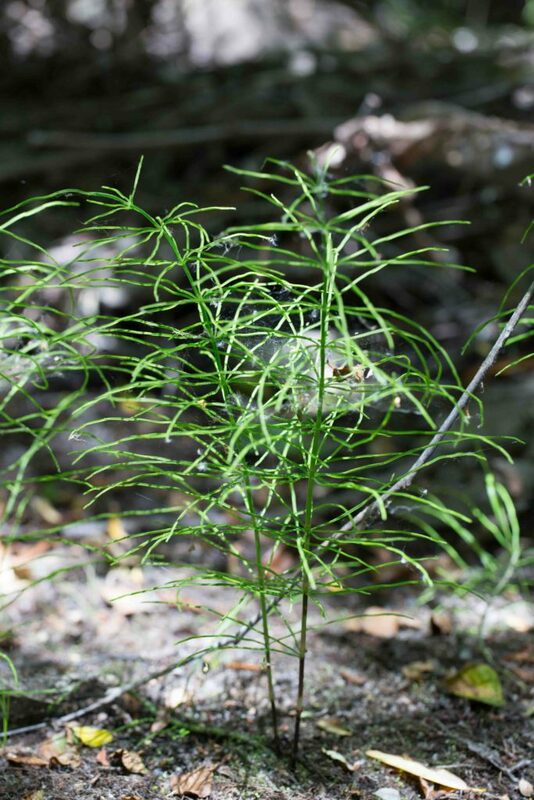 Their family is one of the oldest plant families and the forebears of these modest plants reached heights of 30 m and dominated the Paleozoic forests some 540–250 million years ago. 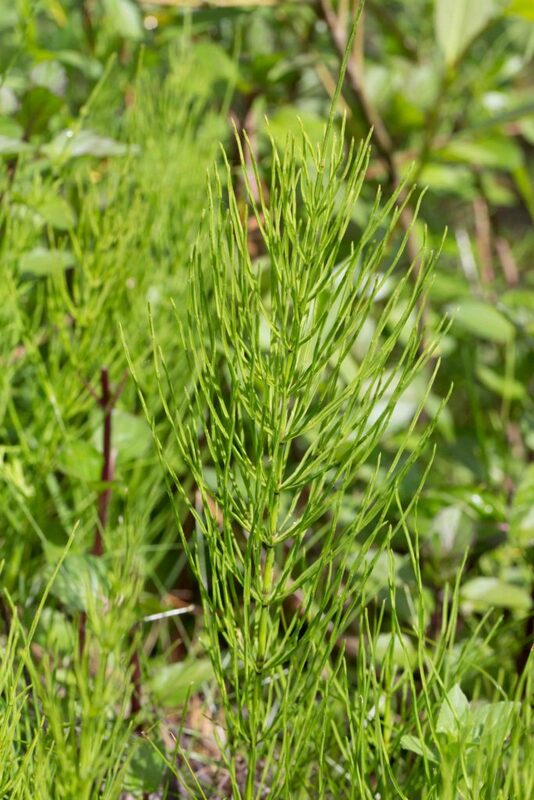 The stems of horsetail and scouring-rush are essentially identical except that horsetails have many branches in whorls at regular intervals up the stem. 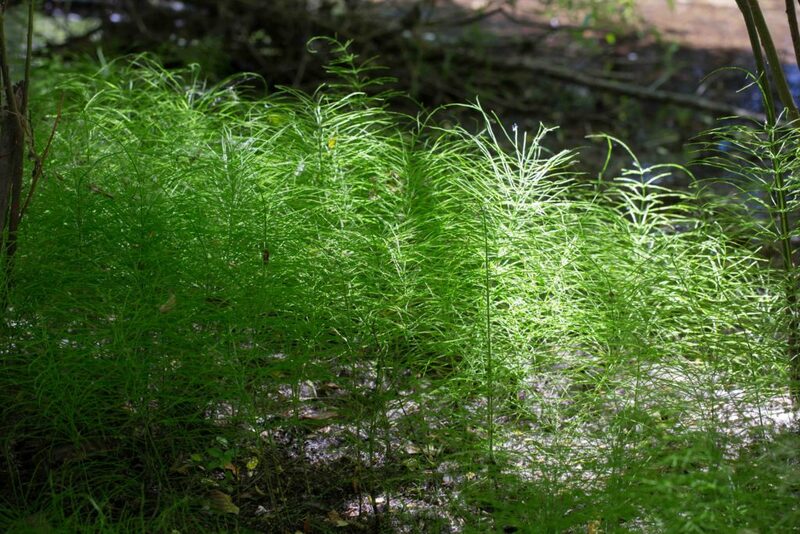 Giant Horsetail is much more robust than Common Horsetail (Equisetum arvense) with 20–30 branches per whorl on the (most commonly seen) infertile stems. 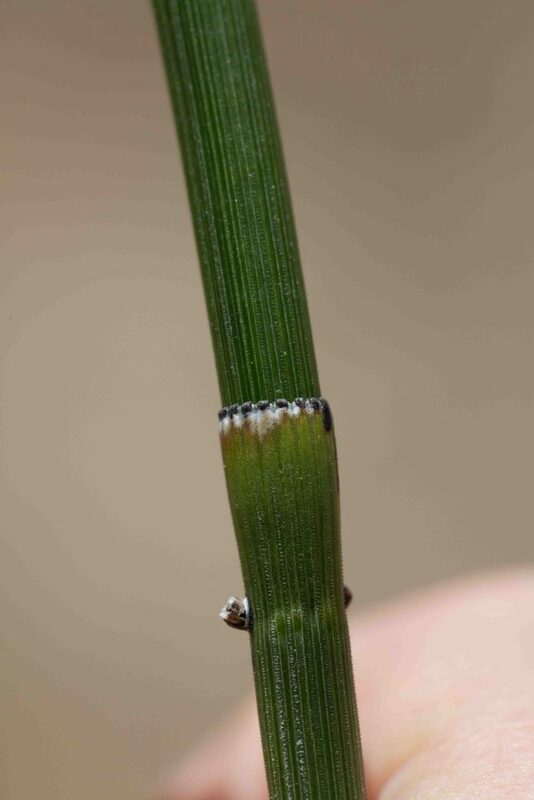 The fertile stems (right hand photo) appear earlier in the spring and die back before the infertile stems mature. 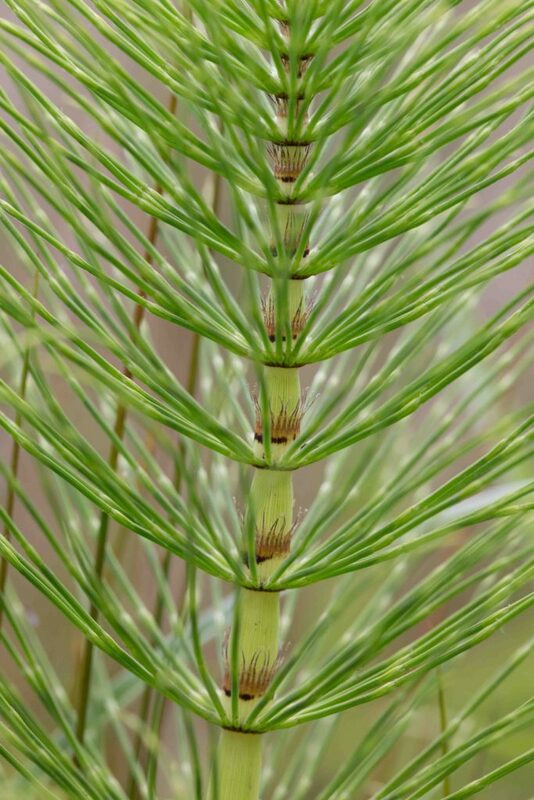 The stems of horsetail and scouring-rush are essentially identical except that horsetails have many branches in whorls at regular intervals up the stem. 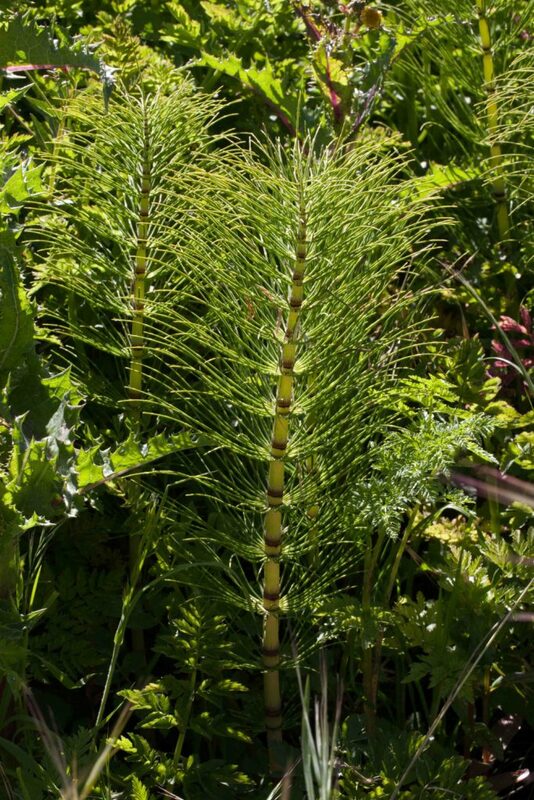 Common Horsetail is much less robust than Giant Horsetail (Equisetum telmateia) with 6–10 branches per whorl on the (most commonly seen) infertile stems. 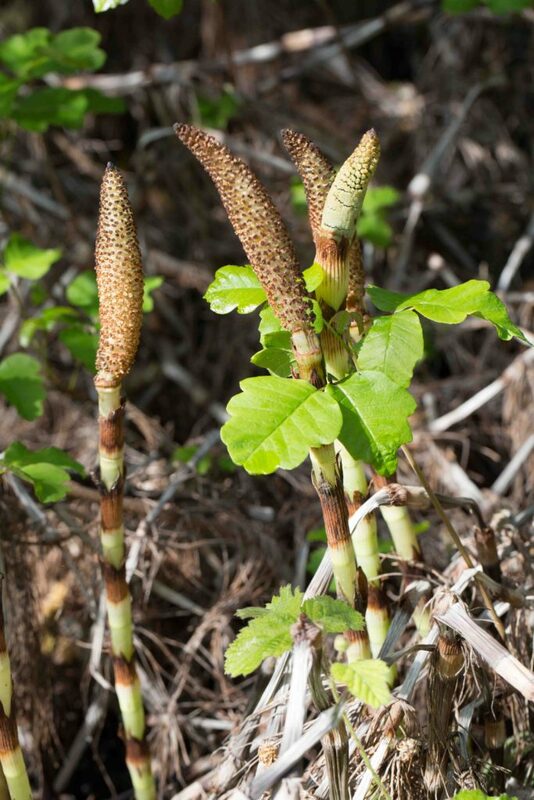 The fertile stems appear earlier in the spring and die back before the infertile stems mature. 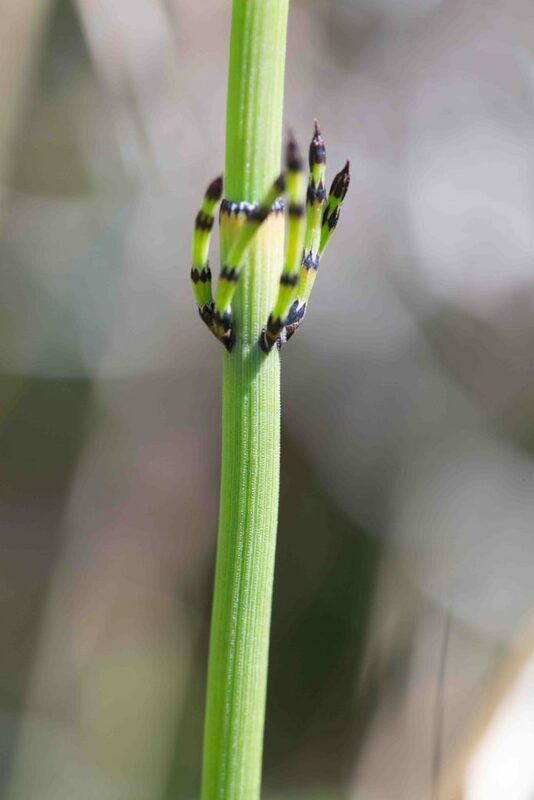 The stems of horsetail and scouring-rush are essentially identical except that horsetails have many branches in whorls at regular intervals up the stem. 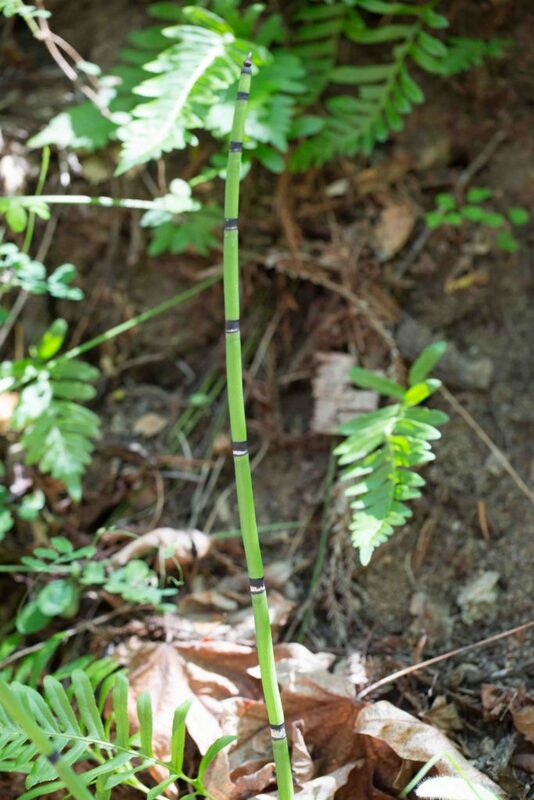 The two scouring-rushes are distinguished by the number of longitudinal ridges and the appearance of the sheaths at the top of each segment. 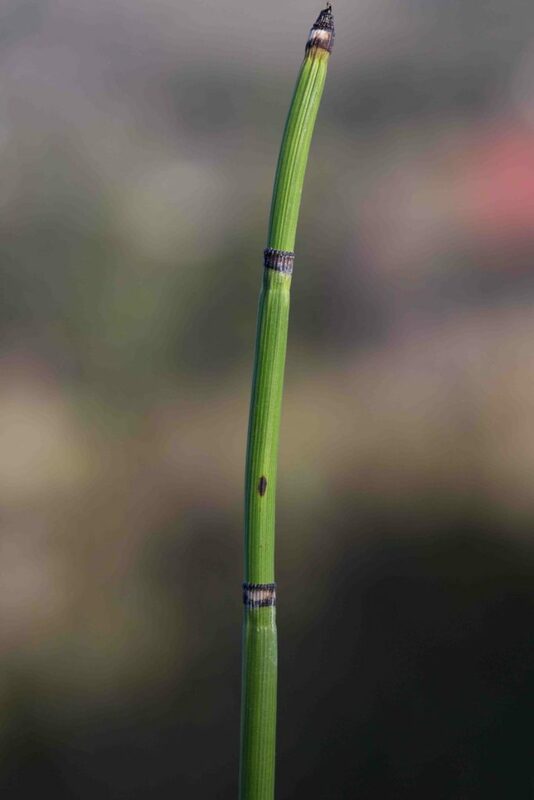 Braun’s Scouring-rush has 10–26 longitudinal ridges and its sheaths are much longer than they are broad, green with a single narrow black band at the top. 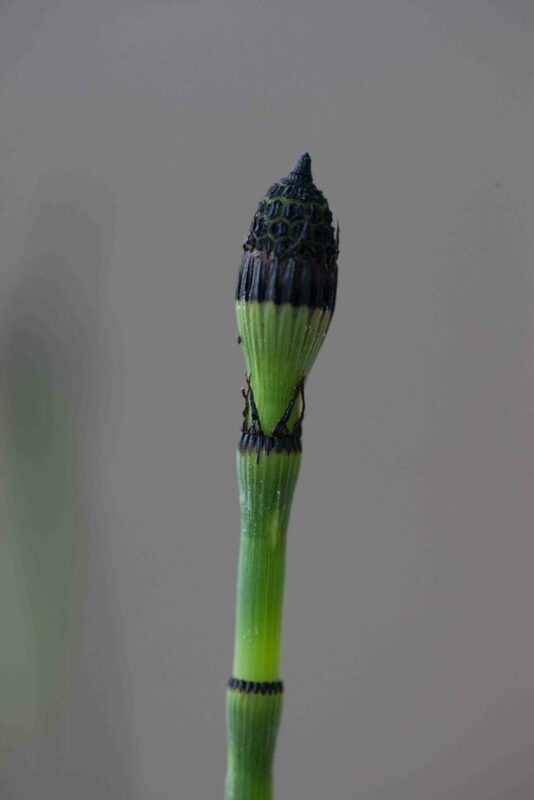 The top of the stem has a cone which typically has a rounded tip. 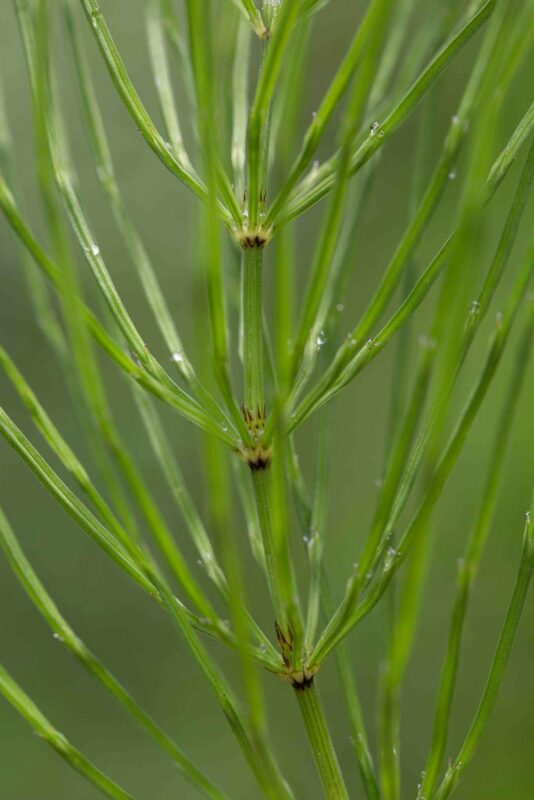 The stems of horsetail and scouring-rush are essentially identical except that horsetails have many branches in whorls at regular intervals up the stem. 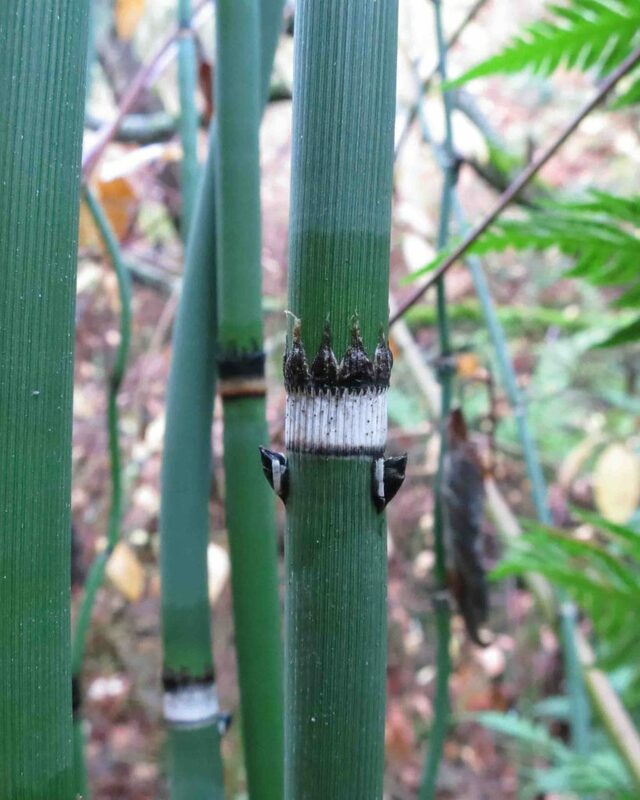 The two scouring-rushes are distinguished by the number of longitudinal ridges and the appearance of the sheaths at the top of each segment. 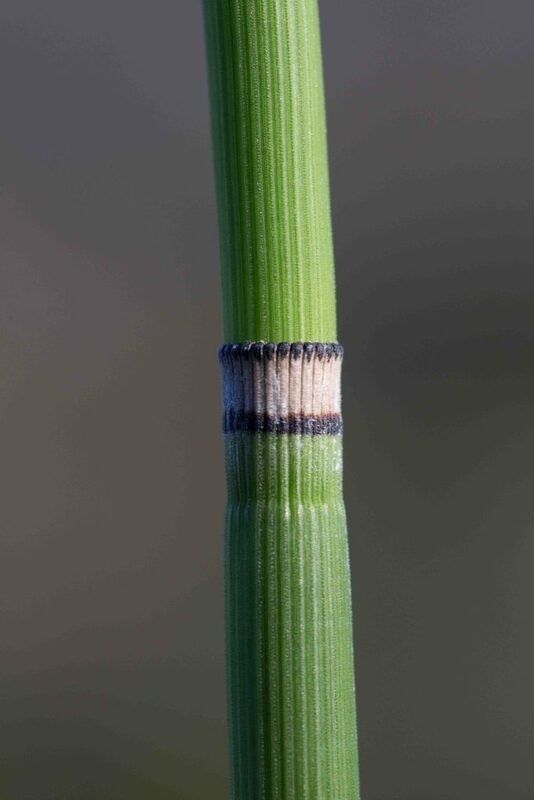 Western Scouring-rush has 22–50 longitudinal ridges and its sheaths are about as long as they are broad, ashy colored, generally with black bands at both ends. 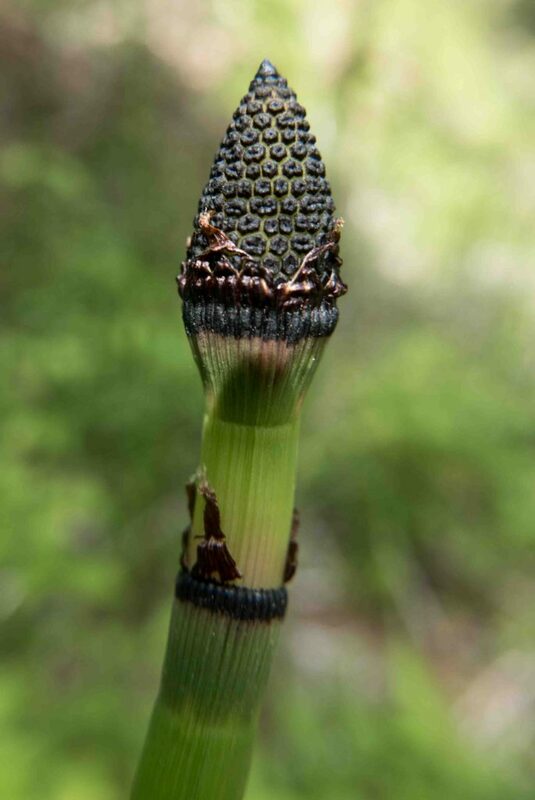 The top of the stem has a cone which typically has a pointed tip.